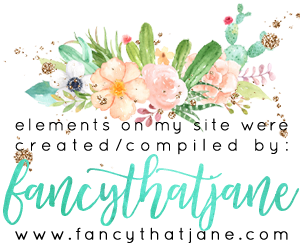 Welcome back to the September OSAT Blog Hop! I am so glad you stopped by this month because it is a Designers Choice! Did I mention we have some new hoppers with us this month?? Make sure you stop by Dena, Renee, Maria, Raquelle and Jeanna's blog and welcome! I am so tickled to have these ladies on our hop with us! I must say Andrea totally knocked it out of the park this month! I just love her work! We have all worked really hard to put together an amazing hop for you so let's get to it! I am so excited about my creations this hop... Color wise it is totally outside of my comfort zone! The card started with a bright base of Watermelon Wonder card stock. I then did a matte in Basic Black to coordinate with tag! 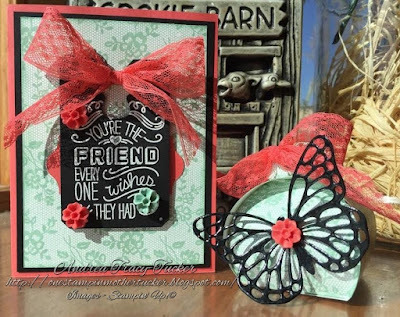 The Whisper White is stamped using the sadly retired I Love Lace background stamp in the new In Color Mint Macaron. I softly daubed the edges of this layer with the Mint Macaron as well. The sentiment is from the Friendly Wishes set. 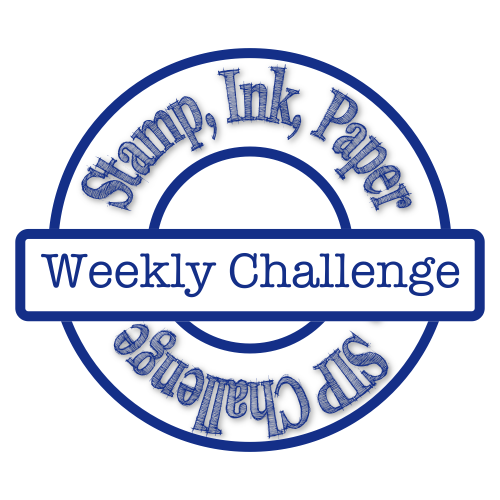 I stamped this using Versamark ink then heat embossed Stampin' Emboss White Emboss powder on my favorite Chalk Tag framelit. I then accented the tag with flower embellishments in Mint Macaron and Watermelon Wonder. I added the Watermelon Wonder tag behind the black to really make it pop! Then I finished it off with the Watermelon Wonder Dotted Lace Bow! My project of course had to coordinate! I cut the pieces used to make the Curvy Keepsake box. Before putting things together I decided to stamp the Whisper White with I Love Lace in Mint Macaron and again daubed the edges. As I put this box together I was thinking that it kind of look like a little sachet. My butterfly I did the clear embossing powder in two layers as I have before to give it that shiny look. 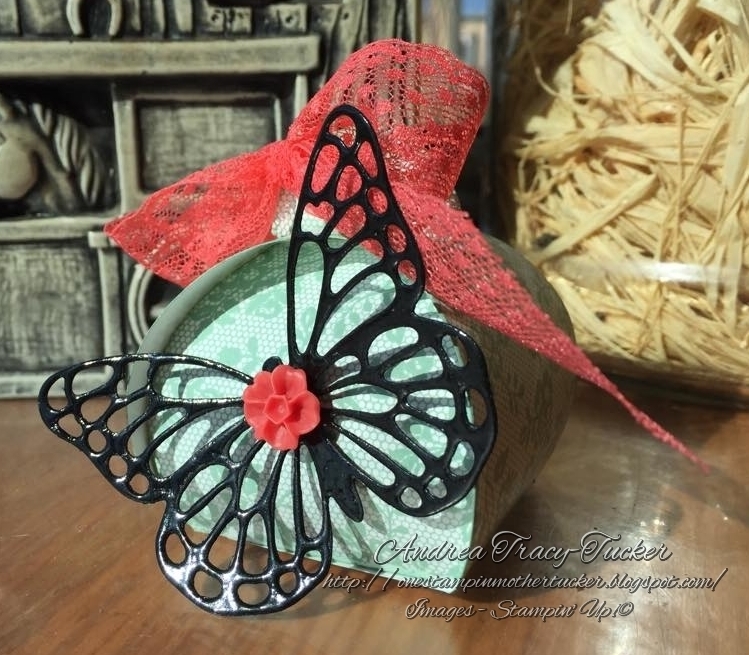 I also accented the butterfly with a in color flower and a Watermelon Wonder Dotted Lace Bow! Phew!!! Done! Feel free to ask questions! Don't forget to tour the whole hop! Next is my #CBF Over-AchiEva! I am sure she is going to have some seriously cute creations! Andrea P You came from here! Andrea T. You are Here!! Labels: Butterfly Thinlits, Curvy Keepsake Box, Friendly Wishes, One Stamp At A Time, Stampin Up, Stampin' Up! Cute projects Andrea! It's fun to go outside our comfort zone...it's when we come up with all kinds of creative ideas. Love how the black butterfly just pops off the box. Thank you so much Diane!! I love the color combination!!! It's so vibrant! You definitely rocked it this month!!! Gorgeous! That black and watermelon wonder paired with the mint macaron really make these pop! Love the color combos! !and the butterfly and....and...lets just say your whole project ROCKS!!!! who cares what is inside the box when the outside looks as pretty as this??? Fun, fun, fun! This color combo may have been out of your comfort zone but it certainly pops! I love all of your attention to detail, especially the shiny embossed butterfly. nothing better than a shiny butterfly framelit!! :) Super cute projects! Thanks so much for inviting me to be part of such an amazing group!! Love these colors!! you ROCKED that butterfly, girl!! I love it! Your color combination is very striking and elegant. The butterfly really sets it all together. Beautiful! You are amazing my friend. 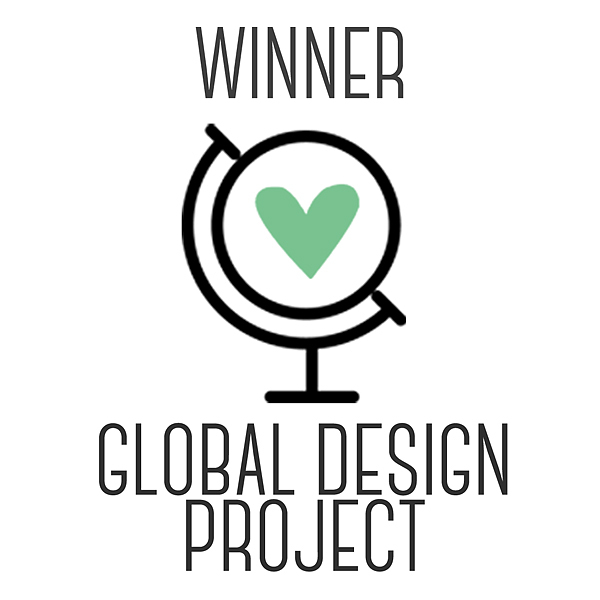 Oh and your projects are gorgeous!!! Going to have to try embossing that butterfly. The color combination is awesome, very bold and really stands out. Love this matching set! Andrea, these projects are beautiful! the black butterfly really does pop! i love your card and curvy keepsake box! i love them! Striking color combo! Love it! Beautiful projects and color combo! Love all of the lacy, pretty details. Great job!